I’ve often wanted but never dared to make a case for historical fiction being more dependable than modern history books. Once the fiction writer is steeped in her research material, she has to make it add up in what Hilary Mantel calls ‘author’s arithmetic’: the facts have to be coherent. In the matter of the Medici children, I’d often been confounded by the history books but by tracking my way using the letters of the time, mostly Poliziano’s, and drawing up chronologies of events, it finally all fell into place with that lovely sense of a jigsaw puzzle solved which I tend, perhaps erroneously, to equate with the truth. That period between Christmas and New Year is a natural for decluttering and in amongst my listless efforts a box of antiquated computer discs was examined critically before being put back where I found it; likewise all my files, occupying precious shelf space. Should they go into store? Is it time to part from them? I think my Renaissance research is finished, its results dead and dust-gathering, but you never know, you never know, and the files remain on their shelves. Then at the end of December a comment appeared on the ‘Books’ page of this blog from Judith Testa, an art historian in the States, asking for what information I might have about the birth dates of the children of Lorenzo de’ Medici because she couldn’t find anything but muddle in the history books. I’d found the same when researching the subject and, with Judith, am surprised, very surprised, that there appears to be no official record of the offspring of a very famous man, some of whom were destined at birth to be famous themselves. As Judith said in our continuing correspondence over the past few days, we know the correct dates for Michelangelo and Raphael, whose future glory was not exactly obvious at their birth, so why not the Medici children? Presumably the records were kept by the Medici themselves and were lost in 1494, at the time the family was sent ignominiously into exile and its libraries dispersed. Although I keep a bibliographic record of research and give my notes code numbers so I can track their source, I’m not meticulous about it, and then my note-taking is particular to my story and not to the subject; that is to say, I don’t take notes about absolutely everything, only what’s relevant. Worried now that I might have got my facts wrong, Judith’s enquiry sent me burrowing into my computer where I was forced to confront what I’d dimly realised before, that there’s stuff missing, early notes, early drafts. For some novels all I have is a pdf of the final typeset. I presumed stuff had been lost in crashes suffered over the years, but Judith pointed out that in fact it’s because of advances in technology. So one of the many resolutions for the New Year, and one I mean to do today, is to send off all those floppies and zip discs I’d found in a box to a conversion service and get everything on to CD. Anyway, after much toing and froing between us, we assembled what we’d gathered over the years related to the birth dates, the actual number of children when modern historians obviously can’t count above the fingers on one hand, and most importantly, establishing which child was the last born and when (given that we’re often led to believe it was about five months after the previous one). We’d got our bits and pieces into agreement by January 1st, then yesterday a slightly embarrassed message came through from Judith saying she’d thought to consult Ask.com. The answer given was full and very detailed and satisfies me even though there is no citation made for sources. 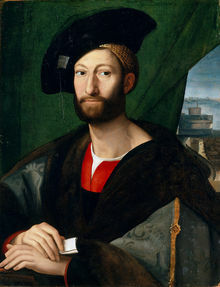 Raphael's portrait of Giuliano, son of Lorenzo de' Medici, who grew up to be the Duke of Nemours. He was conceived in the immediate aftermath of the conspiracy which had caused the death of Lorenzo's brother, Giuliano, and was born when Lorenzo's wife and children were living outside of Florence for their safety. Because I can’t stop sleuthing now, I’ve tracked the source of Ask to Wikipedia, which is very much better with references. The source of the above seems to be the entry on Lorenzo himself, subsection ‘marriage and children’. When I checked references at the bottom, I found a section called ‘Further Reading’ listing all those historians who have failed with the facts. But underneath that is a section on historical fiction listing three novels, all mine, and obviously a much more dependable source of information, because I’d got it all right. And now I’m curious about something else. The name ‘Romola’ which is unfamiliar to me in any context other than the eponymous title of George Eliot’s novel set in the Renaissance, occurs frequently among the Medici girls. Whatever the source of Wiki’s piece is (Encyclopedia Britannica? ), I strongly suspect it was one or derived from one which Eliot used. This entry was posted in Uncategorized and tagged Angelo Poliziano, children of Lorenzo de' Medici, George Eliot, Judith Testa, Lorenzo de' Medici, Romola. Bookmark the permalink. I am utterly delighted to have found your blog. I have been working for quite some time on a novel centered on the Medici family which takes place in modern times. It likely sounds strange, but regardless, I have been searching high and low for the information you have posted here. So, firstly, thank you. If I ever get this novel published, I would love to list your name in my acknowledgments. Secondly, I am so glad to see mention of Angelo Poliziano here, and especially to know that you used his works as references. He is my favorite historical figure and I believe he doesn’t get enough credit. Cheers. I’m glad to see there are other interested parties out there. Hi Giovanni, thank you so much for getting in touch and for your kind words. Your novel sounds really interesting and I do hope it finds a publisher. All acknowledgements gratefully received! You might find extra nuggets of information on lindaproud.com. Any friend of Poliziano is a friend of mine! I felt as if he were my guide throughout the process of writing the trilogy. I really wanted to write his biography but did not have the academic credentials, so I wrote it out as a story instead. Just this year Richard III has been re-established in the hearts and minds of the British nation as a good king – a process which began with the publication of a novel back in the 60s. I do hope one day Poliziano is similarly reinstated as a major figure in both the Renaissance and history of Italian literature. I do believe that the people who murdered him went on to murder his reputation and have been incredibly successful. You still see old lies perpetrated by modern scholars who should know better! Very good luck with your work – tell me more. Oh, my. I’ve just been going through your blog and I’m terribly honored that you’ve replied to me. I was glad to see that you’re getting ebooks of your work together; I’m really looking forward to reading them! I’m a History major and I have heard very little about Poliziano from my professors, but I’m hoping that will change now that I am concentrating more fully in Renaissance studies. I was once told in a Humanities class (in which we studied Giovanni Pico rather extensively) that my knowledge of Poliziano meant I was vastly ahead of the class objective. Still, it was one of the better classes I’ve ever taken. My dream is to teach at the LdM Institute in Florence, but we will see whether that happens. I haven’t gotten to this scene yet but I am looking forward to a particular moment in which Lorenzo is at home recuperating and surrounded by his friends/court: Poliziano, Luigi Pulci, Braccio Martelli, Marsilio Ficino, et al. The only regret I have surrounding this novel is that I’d love to write Giovanni Pico into it, but he was only 15 at the time. There’s always sequels, I suppose. I’ve just followed you on Facebook and I am delighted to have made your acquaintance. Giovanni, did I ever reply to this? If not, I apologise profusely! Spring is such a busy time for me and I haven’t blogged for months. About to rectify that. Meanwhile I hope your novel is progressing well. ‘Write what you know’ is the most misunderstood piece of creative writing advice next to ‘show don’t tell’. It should not be taken literally; if it should, I had no business writing about Italy in the 15th century from a boy’s point of view! It means grounding your imagination with details gained by observation in the here and now. I’m just starting on Ursuala Le Guin’s Earthsea Trilogy (better late than never) and her story of wizards in some other world or universe is rich in evocative detail that she must have got in this world and life. It gives such authenticity. Good luck! If she finds out anything extra and would like to share it with us, I’ll add it to the site. Thank you!